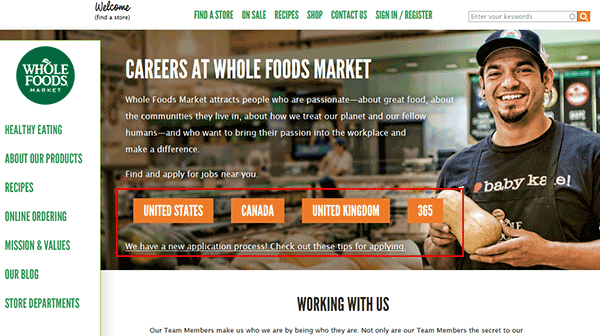 The Whole Foods job application must be completed online (via the careers site). Although certain locations may still accept offline (i.e. printed out) application forms, the majority of stores will not accept them. Read the “Apply Online” section to learn how to search for jobs in your area. 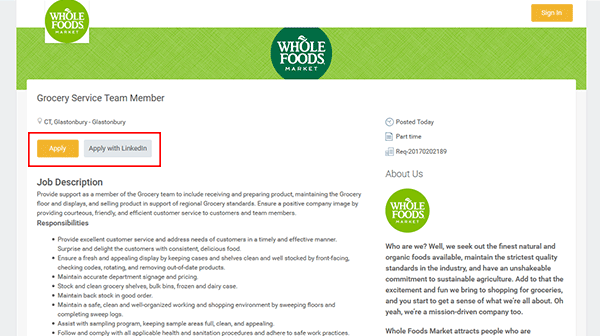 About the Company: Whole Foods Market is an American chain of grocery stores with over 400 locations throughout the United States, Canada, and the United Kingdom. 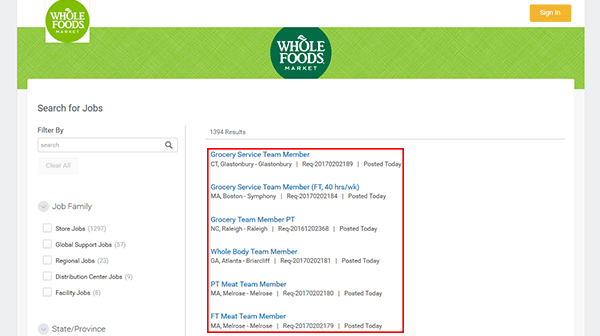 Step 1 – Go to the main careers page (https://www.wholefoodsmarket.com/careers). Step 2 – Select your country by clicking the appropriate link/button. Step 3 – The search results can be filtered by keyword, job family, location, job type, or schedule (full or part-time). Step 4 – Press the link of the job you want to submit an application for. Step 5 – Read the job description (responsibilities, knowledge/skills/abilities, desired work experiences). 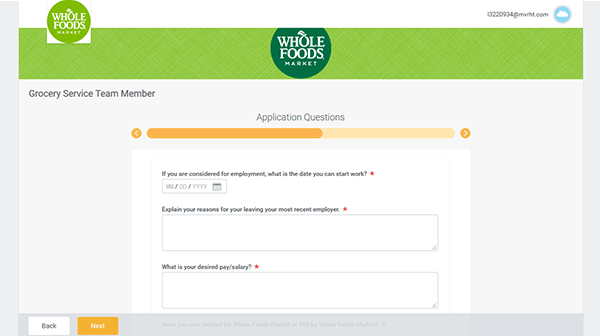 Step 6 – Click the “Apply” button (as outlined in the screenshot) to start the application process. Note: You can also apply using your LinkedIn account. 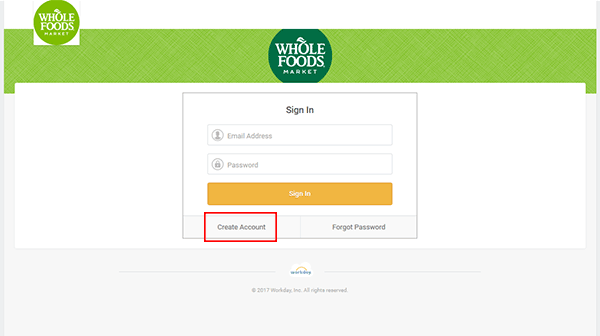 Step 7 – Sign in to your account, or register a new one (press the “Create Account” button). 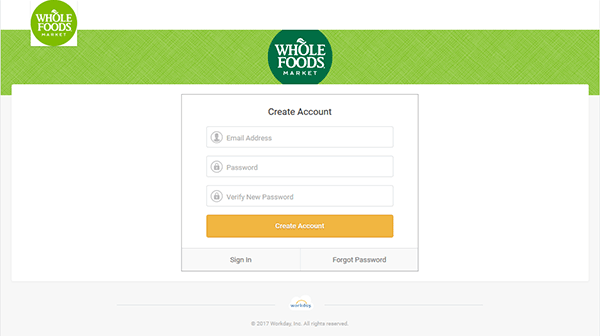 Step 8 – Enter your email address, create a password, and then hit the “Create Account” button. 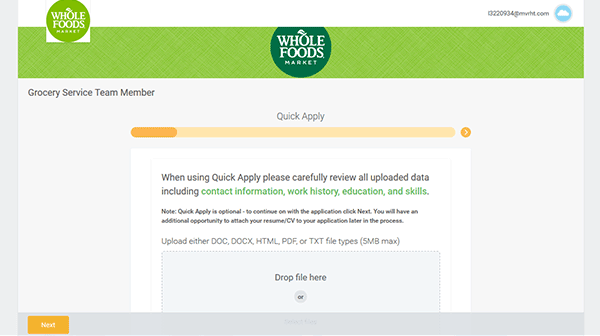 Step 9 – Quick Apply – Upload your resume to use the “quick apply” feature (your personal information will be automatically added from your resume). If you do not want to upload your resume click the “next” button/arrow (outlined below). Step 11 – My Experience – Click the “Add” button under each subsection to add your work and education histories. Enter relevant skills into the “Skills” subsection, upload your resume, and then click the “Next” button at the bottom of the page to go to the next section. Step 12 – Application Questions – Provide answers for all of the required questions. Step 13 – After finishing the remaining sections of the form you will be able to review and submit your application.